Our Newsletter solution will help you to save your precious time. Use automated mailing by Supsystic and enjoy the life. Newsletter plugin offers you immediately, daily, weekly and monthly mailings of your website or blog content. 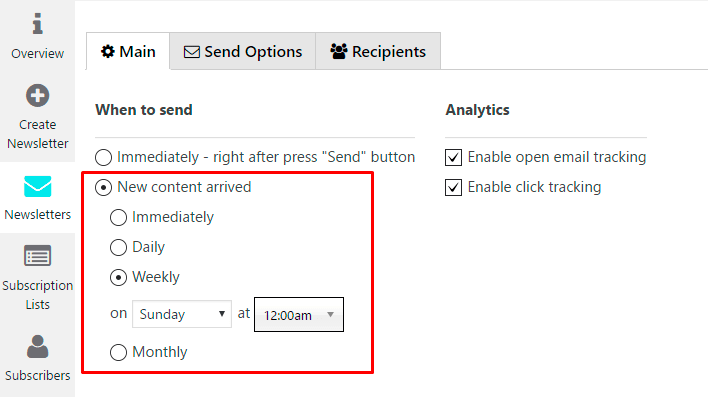 For daily, weekly and monthly options you will be able to set the time of mailing. Dynamic content blocks and automated newsletter greatly facilitate the subscribers lettering about new content of your site or blog. Use these features together to save your time. Simply choose the variant of automated mailing, configure the number of posts for block with dynamic content of your newsletter template, save the settings. That is all. Our plugin will take care of your newsletter at the right time.